The work in Belfast City Mission Jersey Street has been in existence since 1890. The original hall like so many of that era was used as a school during the day and as a Mission hall at night and weekends. The first Missionary was Mr David Officer appointed in 1892. He was followed by Mr James Tolland 1897-1904, Mr Ernest Barr 1905-1914, Mr James Bell 1915-1916, Mr Thomas Magill 1916-1919, Mr James White 1919-1922, Mr Samuel Kerr 1922-1924. Mr John Kelly was appointed in 1924 and during his 12 years in the district he carried out a very unique work. 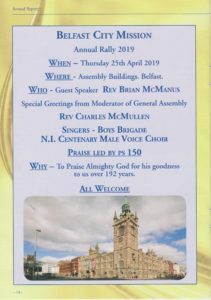 He became known throughout the whole Shankill area especially as he would have engaged with many workers on their way to work in Mackies factory. Sadly Mr Kelly died on 14th February 1936 at the very young age of 38 years. Mr Samuel D McCaughey took up the duties for a short period until 1938 when Mr David Mawhinney was appointed to the work. Mr Mawhinney served for 10 years before taking up a role with the Canadian Home Mission. Mr Samuel McCrea who had previously served in Hillview Street was then transferred to the work in Jersey Street in 1948. Mr McCrea left the Mission staff in 1954 to take up duties with the Lord`s Day Observance Society. He was succeeded by Mr William Irvine who had spent a short period in the Old Lodge Road District. Mr Irvine resigned from the Mission staff in 1959 to take up similar work in Australia. Mr Thomas J Robinson was appointed to Jersey Street from Bellevue Street. Mr Robinson retired from the Mission in 1965 having given 45 years of service to the Belfast City Mission. Mr Edward Brown was transferred to Jersey Street after having spent seventeen and a half years in the Mountcollyer district. In 1971 Mr Brown resigned from the Mission to emigrate to Canada and he took charge of a Church there. Mr Denis Bannerman was appointed to the Mission on 13th September 1971 and after assisting in Hillview Street he took charge of the work in Jersey Street. Mr Bannerman resigned from the staff in February 1975 to take up a role as Lay Assistant in Immanuel Presbyterian Church. Mr Harry Rea then took up the role in Jersey Street. The work in Jersey Street became more difficult in 1977 as fire destroyed the Mission Hall 17th June. After the blaze Mr Rea was standing outside the shell of the building when a woman from the area handed him forty pounds to help rebuild. That lady had never attended the Mission hall but obviously knew the influence the Mission had in the area and how important it was. This eventually led to the hall being rebuilt and it was re-opened on Saturday 1st April 1978. Mr Rea left the Mission in 1982 after receiving a call to Newtownards Congregational Church. 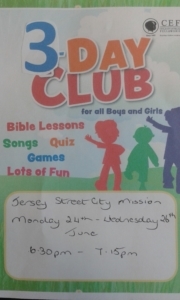 Mr Tom McKendry was appointed to the Mission and began serving in Jersey Street 30th September 1982. He served for two years before receiving a call to Larne Congregational Church. This brought Mr Lloyd Watson to the work in Jersey Street on 3rd January 1985. 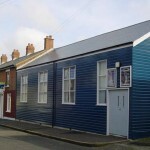 Mr Watson was to be the longest serving Missionary in Jersey Street with 25 years faithful service until 2010, when he transferred to Kilburn Street. During this time Lloyd was to oversee the building of the present hall which was opened Saturday 23rd June 1990. 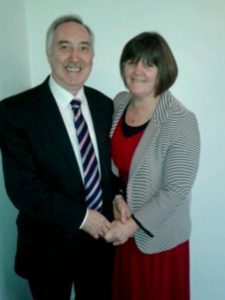 The present Missionary Mr Tom Gamble was appointed in 2010 after serving in Rathcoole, Bellevue Street, Mayo Street and Sandy Row respectively. Almost 129 years have gone since the Belfast City Mission commenced the work in Jersey Street and district. The hall has been greatly used and blessed throughout. The aim of the Mission is to continue to be an influence in the community and to guide many to faith in Christ Jesus.